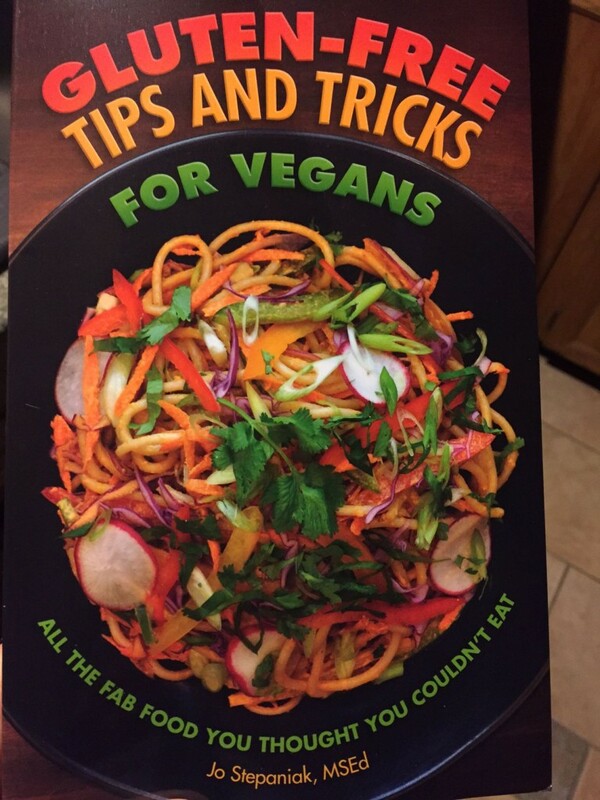 I received a copy of Gluten-Free Tips and Tricks for Vegans by Jo Stepaniak, MSEd to review. This book is terrific for someone trying to understand the basics of living with gluten intolerance and Celiac Disease. It contains handy lists of foods to avoid and details on gluten-free grains to use as replacements in cooking. Stepaniak shares a wealth of information on fundamentals including flour and spice blends to get new gluten-free cooks started. The chapters that follow have many comfort food recipes including breads like “Sunny Seed Bread”, breakfasts like “Good Morning Muesli”, salads, main dishes, sauces and desserts like “Chocolate Peanut Butter Pie”. Nutritional information is included for all recipes. The recipes are made with easy-to-find ingredients and accessible to the everyday cook. They are fairly healthy too. The book doesn’t feature beautiful color food photos and the photos it does have are generic black and white shots of ingredient. While it would have been nice to see a few of these recipes pictured, the recipes stand on their own without photos and I can’t wait to try a few. Stepaniak keeps this book short, sweet and to the point. All 147 pages are packed with useful information and recipes – no filler or fluff. If you or someone you know needs to eat gluten-free and vegan, I’d highly recommend Gluten-Free Tips and Tricks for Vegans. The book is published by Book Publishing Company and retails for $12.95 US, $16.95 CAD.